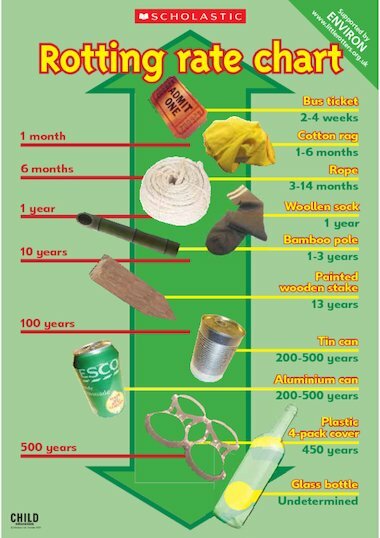 Use this poster in the classroom as an effective way to show children how long it takes for various objects/materials to rot. See the Environment special on pages 17-23 of the October 2005 issue of Child Education. I thought only organic materials can be said to ‘rot’. The other materials may ‘decompose’ or ‘brak down’ but it’s a different process, not bacterial. I have found this a really useful resource to raise awareness about litter and recycling in schools and have used this a lot over a number of years. Thank you so much for this resource – it is good for use with adults as well as children & a great tool for raising awareness during ‘Green Weeks’.